The Federal High Court in Ikoyi, Lagos has ordered the remand of three officials of the Independent National Electoral Commission (INEC) in the custody of Ikoyi Prison until their bail conditions are met. 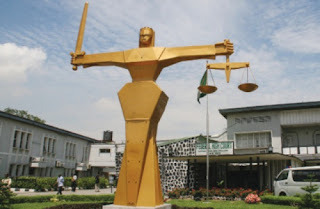 The remand order was made by Justice Muslim Hassan shortly after the three officials, attached to Ogun State, were arraigned for allegedly laundering N179.8m. The defendants — Yemi Akinwonmi, Dickson Atiba and Ogunmodede Oladayo — were taken before the court by the Economic and Financial Crimes Commission (EFCC), which accused them of conspired among themselves to take possession of the N179.8m in March 2015, days before the general election. The anti-graft agency said they received the money from one Adeyinka Ayo-Aina when they "reasonably ought to have known that the money formed part of proceeds of fraud". It added that they handled the cash without going through any financial institution, contrary to the provisions of the Money Laundering (Prohibition) Act, 2011. The EFCC, through it counsel Nneameka Omenwa, alleged that the first and second defendants, on or about April 7, 2015, made and accepted a cash payment of N69m, "which sum exceeded the amount authorised by law without going through a financial institution and you thereby committed an offence contrary to Section 18(a) of the Money Laundering (Prohibition) Act, 2011, as amended, and punishable under Section 16(2) of the same Act". The three defendants, however, pleaded not guilty to the eight charges pressed against them. While adjourning till August 6, 2018 to take their bail applications, Justice Hassan ordered that they should be remanded in Ikoyi Prison.